We’ve have put art in our window like our pony bead sun-catcher and we closed the blinds for 8 Ways to Learn in the Dark, but building with magna tiles to make stained glass was a first for us. And, guess what? It was so simple to set up! Did you ever notice the little holes at the corners of the Magna Tiles? I didn’t either! 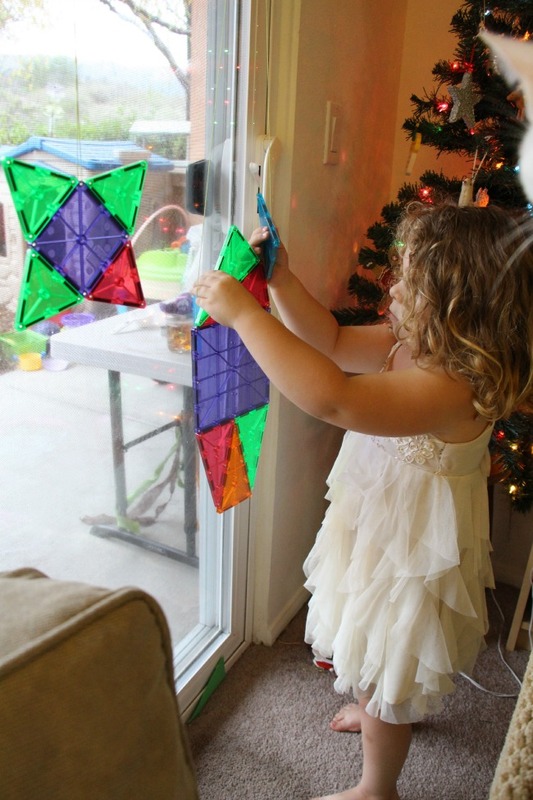 But, I’m glad I did because it’s how you can hang Magna-Tiles in a window!! Cut a long piece of your thread or string and thread it through one of the holes in the Magna-Tiles. Then, loop the thread around a curtain rod to hang the individual tile in the window. And, start building with magna tiles! Amazon links provided for you – thanks for the support! 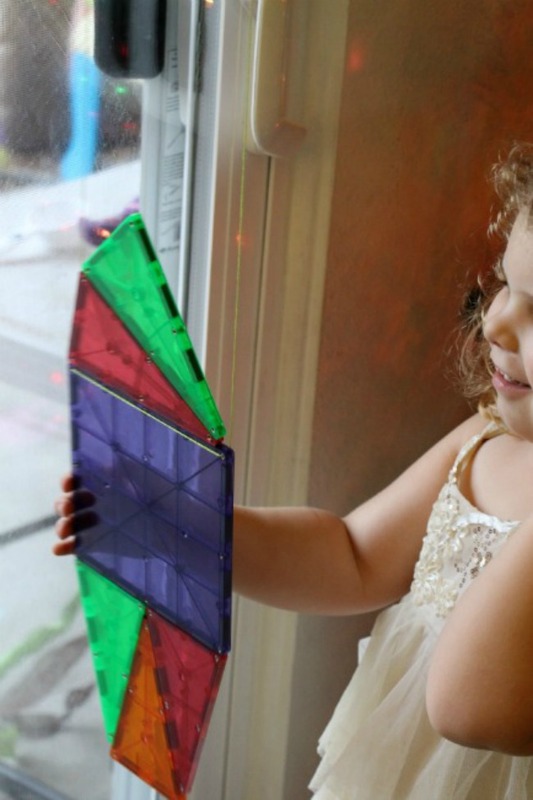 Where’s the learning when Building with Magna Tiles? We experimented with different shapes and directions to place the tiles when we were building with magna tiles. If the structure gets too heavy or crooked, it will fall. My daughter got a little frustrated by this when she was building with magna tiles, but when she got it to balance properly, she was thrilled! Gravity/Force – What weights and shapes will make it fall? Magnetism – Where do the magnets connect? How much weight can the magnet hold? Trial and Error – What works and what doesn’t when you are hanging each Magna-Tile? Persistence and Engagement – When it falls it’s pretty discouraging, but being able to focus and finish your task takes a lot of AWESOME patience!! Geometry – What shapes do you use? What shapes will you make? Art – What is stained glass? When did this type of art start? Who used it? There are tons of learning opportunities from this activity, but the most important part is that it is such a fun and unique way to create and to learn while building with magna tiles! 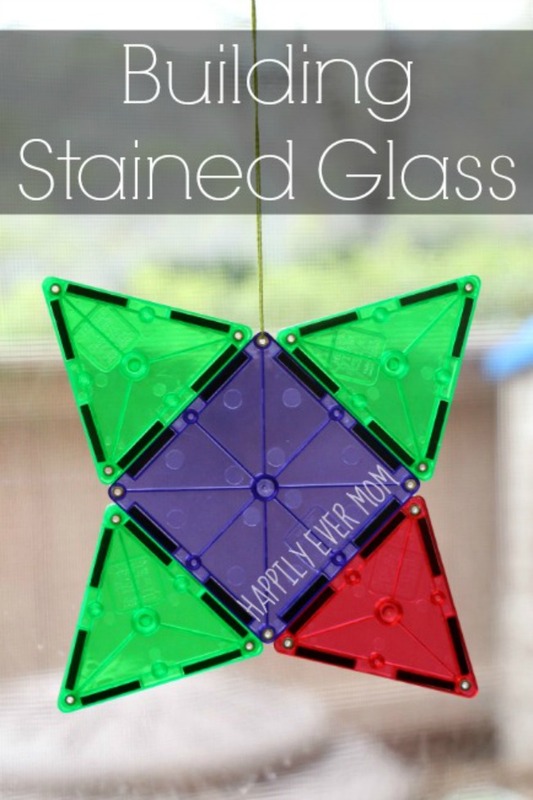 I wonder what your stained glass will look like?! How do you play and learn with magna tiles? Thanks, Rebecca! I hope you love it as much as we did! !